Samaria Regional Council holds reception to welcome French olim to community of Bruchin. Hundreds of residents of Samaria came out this week to greet the immigrants who came from France in the summer to live in the town of Bruchin in Samaria. 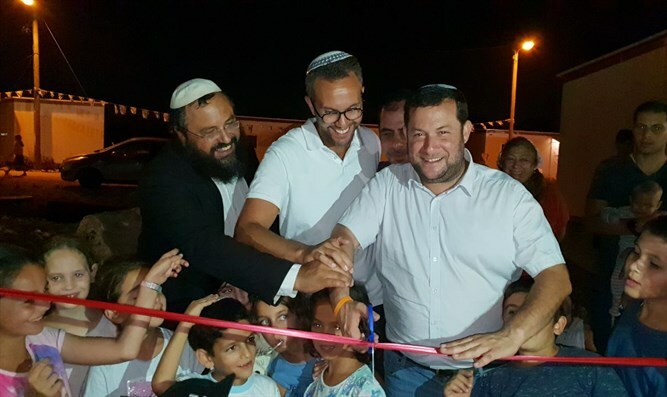 The olim arrived at a communal aliyah event, which has been held for the fifth consecutive year in the Samaria Regional Council. After the reception ceremony, the new immigrants' neighborhood was inaugurated and the participants set up a mezuzah together with the last oleh who arrived that night in Samaria at the entrance to his new home. "The Samaria Regional Council has decided to take part in the great Zionist act of bringing immigrants to Israel, and we are confident that the many immigrants from Samaria will eventually bring hundreds of thousands of immigrants here, just like in other places in the country." "It is not an easy choice to leave France, a beautiful country, We have our families, our friends, our habits, but deep down we knew that this would be the best choice, to come home at last" said Dan Tobi, a film producer who immigrated to Israel this week from Paris to Samaria. "The truth is that it was easier to live in a city with a lot of immigrants from France, but from the moment you see Bruchin, it's love at first sight. You cannot leave this place. We are proud and feel honored to be part of your project, part of your life, part of the beautiful family that you are " . Each family that immigrated from France was joined by three "adoptive" families. Each immigrant was accompanied by an employment counselor and the youth was divided into teams that assist immigrants in babysitting, summer camps, home decor, and more. Over the past five years, about 250 immigrants from 53 families have immigrated to Samaria, on a communal immigration route. None of them have left Israel and almost all have remained in Samaria. The Aliyah project is supported by the "Absorption of Jewish Communities" association headed by Shalom Vach.